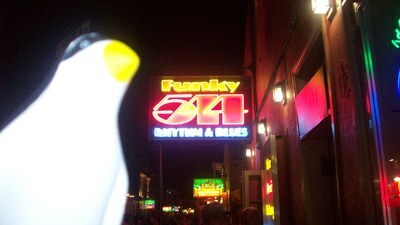 Pierre the Penguin, an unofficial Governors State University mascot, posed by neon lit signs at night in New Orleans, Louisiana. The photo was announced as a first place winner in "Pierre at his Best" on pp. 1, 2 of the September 20, 2010 GSU View in the Take Pierre on Vacation contest.